4. TazeDirekt.com: Branding charm or operational basics? 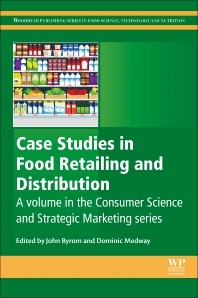 Case Studies in Food Retailing and Distribution aims to close the gap between academic researchers and industry professionals through the presentation of ‘real world’ scenarios and the application of field-based research. The book provides contemporary explorations of food retailing and consumption from various contexts around the globe. Using a case study lens, successful examples of practice are provided and areas for further theoretical investigation are offered. This book is a volume in the Consumer Science and Strategic Marketing series. The book will be of value to practitioners, academics, and students with interests in the food retailing and distribution industry: marketing, communication, R&D managers in the food sector; academics in the in the food business, agribusiness and consumer science courses; postgraduate and undergraduate students attending business schools, faculties of agriculture and degree courses in food science; entrepreneurs and managers of SMEs in the food sector. Dr John Byrom is Lecturer in Marketing at the University of Manchester, UK. Reflecting his academic background in geography and marketing, John’s research interests are concerned with the relationships that exist between organizations/consumers and their broader environments. The context for much of this research has been the retail sector and includes studies of locational planning, independent retailing and retail history. He has extensive experience of teaching and learning, research, consultancy and administration in Business School settings. He has published over 25 refereed journal articles and numerous conference papers and book chapters. His work has appeared in Cities, European Journal of Marketing, Journal of Business Research, Journal of Small Business Management, and Marketing Theory, amongst others. Professor Dominic Medway is Professor of Marketing and Deputy Pro-Vice-Chancellor at Manchester Metropolitan University, UK. He is an international authority on place marketing and management and his original work in this area began in the mid-1990s when he was part of a team of academics looking at the emergent topic of town centre management within the UK. His work has since continued to examine the complex interactions between places, spaces, and those who produce, manage and consume them, reflecting his academic background in geography. Recently completed studies have addressed issues such as stakeholder interaction in urban place partnerships, how litter affects people’s perceptions of space and crime, and the potential role of smell in the marketing of places. Dominic is the Academic Editor of the Journal of Place Management and Development, ranked 9th out of 122 Urban Studies journals in Scopus in 2016. His own work can be followed in a number of leading academic journals, including: Environment and Planning A, European Journal of Marketing, Journal of Environmental Psychology, Cities, Industrial Marketing Management, Journal of Business Research, Marketing Theory and Tourism Management.